Attayak Ali Zalabea is driving us into the desert. He knows where he is going despite there being no roads and signs. After 20 minutes of bouncing in the tray of his Toyota ute, we arrive at his camel racing farm. Zalabea is a Bedouin and wears bright red-and-white checked traditional headwear known as a shemagh in Arabic. Unlike many Bedouins, who live nomadic lifestyles tending goats and sheep on the fringes of the desert, Zalabea is a tour guide. He shows international visitors around the dramatic landscapes of the Wadi Rum region. Camel racing is his hobby. His father and grandfather were Bedouin camel racers and now his son “likes helping in the holidays”. The sport dates back centuries. When camel racing became a big business in the 70s, young male children and babies were being snatched from poor families in Bangledesh, India and Pakistan to work as child jockeys. In 2005, after pressure from UNICEF, the UAE banned the use of child jockeys and other countries followed their lead, including Jordan. Robot jockeys have since become widely used. Zalabea says people started using mechanical jockeys for camel racing about eight years ago, after the government built them a camel racing track. Before this the camels and their riders would race “for miles through the desert”. The robot jockeys are secured onto the camel, with a saddle around the camel’s hump, in a similar way to a saddle on a horse. The robot jockey contains a walkie talkie, allowing the trainer to talk to the camel and send commands during the race. There is also a voice-activated whip attached to the robot so the trainer can control the pace of their camel, like a human would on a horse. Zalabea says it took people time to get used to it at first. But now “it is becoming the modern sport”. 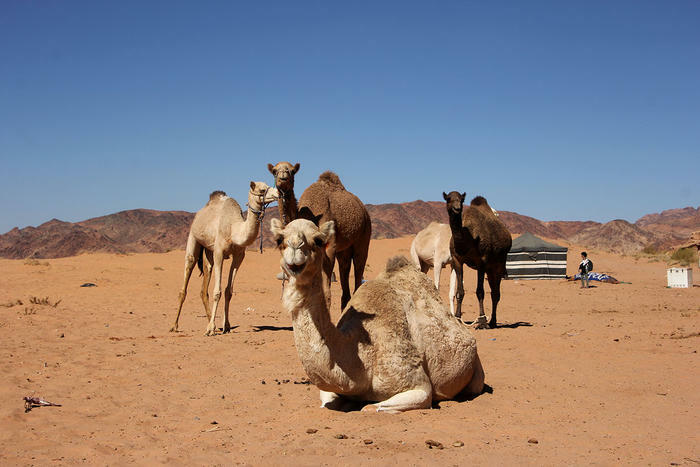 Although Zalabea does not get much signal at his current farm in the desert, he says all of the camel races are organised using the popular group messaging platform, WhatsApp. They all have different groups on Whatsapp, some for organising races and others for selling camels. Zalabea has to drive into the Wadi Rum village to use the internet service. Training a camel is not just about fitness. Teaching them to understand the trainer’s voice and commands is the biggest challenge. "You have to have patience, this is most important,” Zalabea says. It takes years to teach them to listen and some camels are never good enough to race. One of the biggest problems in the camel-racing industry is seeking veterinary care, which is expensive. Trainers mostly rely on their own knowledge to treat the camels. While most of the trainers and camels are from Jordan, Zalabea hopes it becomes more of an international sport in future because then “there will be more market for camels”. “I like this type of sport. To breed the camel and to see them win the race, [makes me] very happy”.